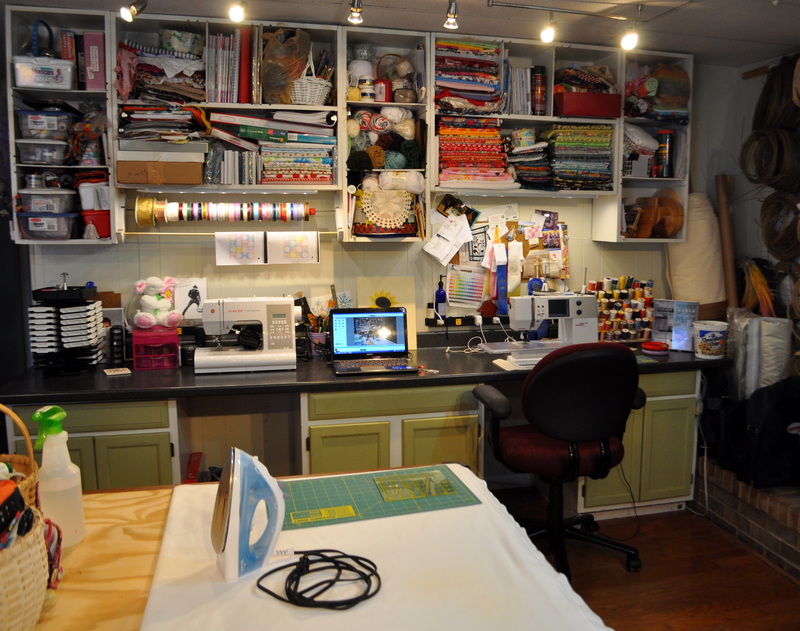 One of the many items on my list to do this year was to clean my craft room. It has been at least a year since I have cleaned to the point that I could see all my counter tops at the same time. I would clean a little bit here and there just to have room to do the current project I was working on, but then it would quickly get messy again. So, I have spent the last 3 evenings working on cleaning up my space. I didn’t get down deep and purge any old stuff, but at least I can cut, iron, and sew without having to move piles or continually drag stuff onto the floor and then trip over it. The other thing that makes this harder is the fact that I am interested in so many different hobbies. So, I’m trying to fit supplies for quilting & sewing, embroidery, crocheting, basket making, and general hobby stuff (paint, stamps and ink, paper, heat gun, etc) all into an area that is about 100 square feet. It’s actually just 1/2 of a larger room, so I also have only have one wall and about 5′ of another wall to work with. But it keeps it all out of the dining room and family area, so I’m happy to have an area that is permanent and doesn’t have to be moved or cleaned up continuously. Welcome to my craft room. We built this area several years ago, but I’m not sure it’s ever been this clean. The first thing you will notice is a pool table in the middle of the floor. We covered the table with a large sheet of 3/4″ ply board. I have converted it into my cutting table on one end, and my ironing area on the other end. In the middle, I have piles of fabric and patterns that won’t fit into the cubby holes (we’ll get to those in a minute). (Note: I might have a fabric addiction.) I also have, in the middle of the table on the other side, a basket of UFOs and a basket of embroidery thread. Under the table are plastic containers with (more) fabric, yarn, general craft supplies, and more UFO’s. On the short wall I have a peg board full of basket making reeds of all different sizes. The corner holds my large roll of quilt batting. And along the long wall I have 10′ of desk space, cabinets, and shelving. We built the shelving. There are 7 areas that are approximately 13″ x 34″ each. They can each be divided into 3 sections using removable dividers. The desk area is divided into 2 main sitting or sewing areas. It is a 10′ piece of counter top from Lowe’s that is sitting on 3 bottom cabinets. The cabinets came from a Habitat Re-Store. They were 80’s yucky wood cabinets so I painted them inside and out. 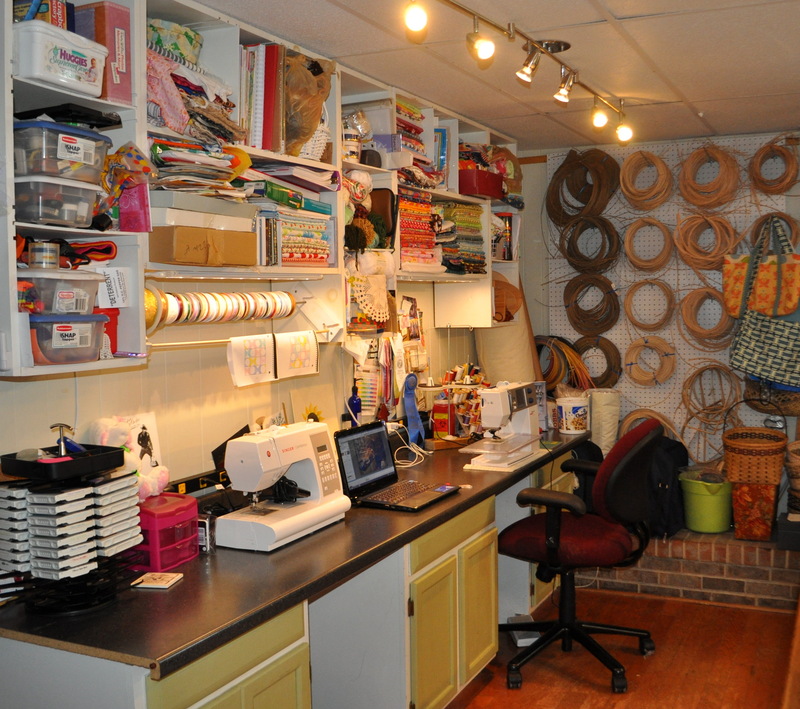 I also have an inspiration wall over my sewing machine, and a ribbon and small design area over the other sitting area. Inside the cubbies is (more) fabric, yarn, basket making supplies, software, embroidery hoops, magazines, pictures, and craft supplies. On top of the desk is 2 sewing machines — my Bernina that I use all the time and my old Singer that I still use sometimes — laptop, thread, stamp pads, brushes, pens and pencils, etc. I have two 10-outlet power strips over the desk as well so I have plenty of room to plug in the laptop, sewing machines, phone charger, iPad charger, external hard disk drive, camera battery charger, rotary blade sharpener, extension cord for iron, halogen lights over the sewing areas, etc. (It is really quite ridiculous how many electronic things we have). And in the cabinets — sewing notions, polyester fiber fill, stabilizer, and stamping and scrapbooking supplies. Lighting… we installed halogen light strips over each of the sewing areas. Also, we have a a strip of daylight bulbs on 3 sides shining on the pool table. I do still get shadows, but overall the lighting is very good for detailed work and much better than your typical room lighting in any house. So, that’s it. It will be very nice to work in a clean room. But I also have no misconceptions about it staying this way. Like most creative individuals, I can be pretty messy. And now I can mark something off my list… but in the process, I found another 10-12 UFOs to add to my list. And we won’t even talk about the fabric I found that I bought for projects that haven’t even been started yet. This entry was posted in Crochet/Knitting, Quilting/Sewing and tagged area, clean, craft, desk, fabric, lighting, messy, organize, organized, quilting, room, sewing by monkeyneedle. Bookmark the permalink. Great space!..to die for, mine is simply a rather small bedroom…but you’ve inspired me to make it better! thanks for stopping by lifeislekker! 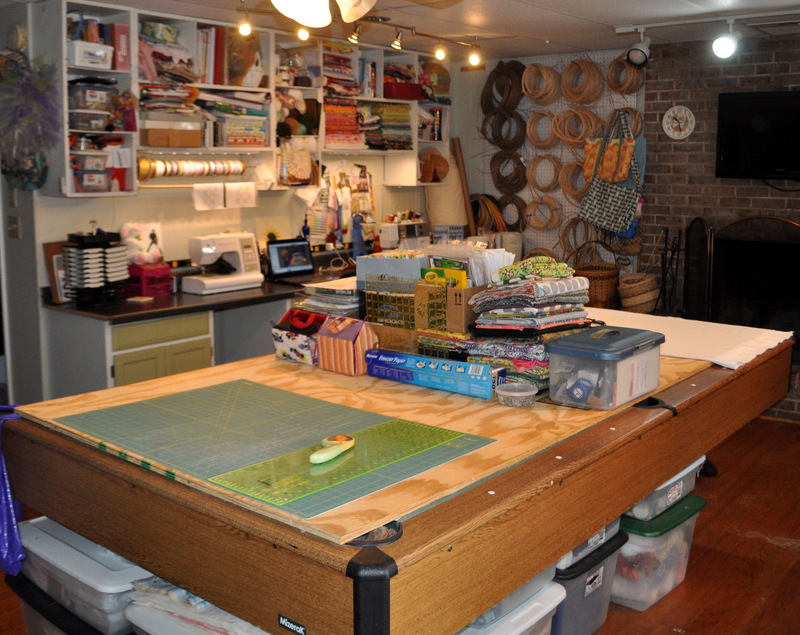 your craft room looks amazing. 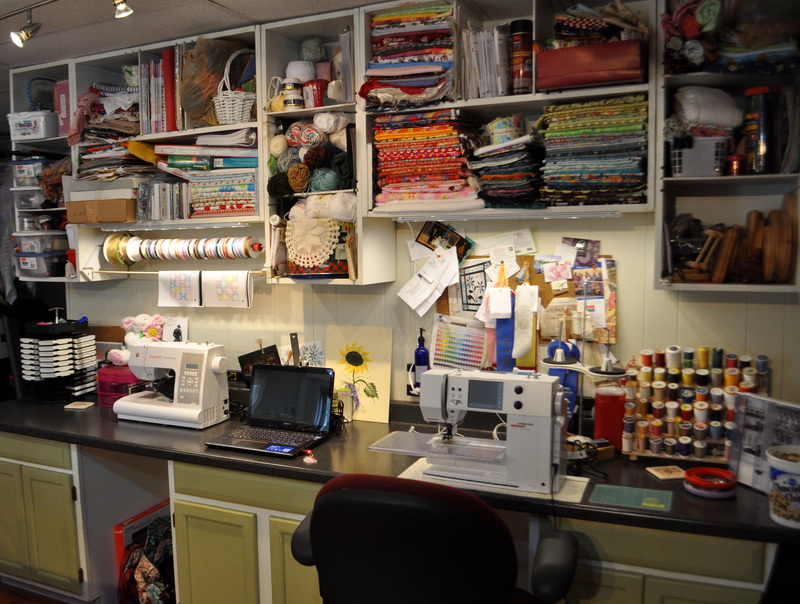 i don’t know how to sew, but if i had a craft room like that i’d sure what to learn. hoping to learn how to crochet soon. enjoy the kale pesto if you make it! I’m sure you will end up with something that suits you perfectly. I would love to see it when you get done.